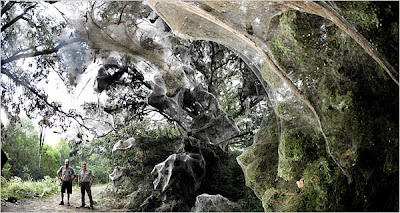 Since the summer began, a single enormous spider web has slowly overtaken a park near Dallas, Texas. Home to millions of arachnids, the web is smelly, sticky, and so thick in places that it blocks out the sun. It even seems to emit an eerie whine, as the countless insects it's captured struggle to free themselves. Scientists can't figure out why the spiders, which are usually loners, decided to build such a remarkable community--or how they managed to do it so quickly. I wouldn't want to be a bug around there! I want to borrow this for Halloween! you know, same thing in New York. There is this section of the park/beach with all the trees and webs and BLOOD. I repeat: BLOOD. Now, spiders are everywhere and they are HUGE. How I know this? Because I chose to ride my bike cause there was nothing to do. I did not mean to ride into a freak-a-palooza of ninja spiders with webs as nunchucks. Blood as a reason to run. Lesson learned: no more bike riding through parks/beaches that have signs "warning! Warning! Deadly toxics up ahead!"